The college admissions process is a pivotal time period for your high school student. With assistance from our experts in college admissions, beginning the college application process doesn’t have to be stressful. We offer comprehensive consulting packages working with students starting in 9th – 12th grade. We serve high school students of all academic backgrounds and interest. We believe all students should have access to success in their career and academic paths. We offer packages that allow your high school student to customize their college plan. 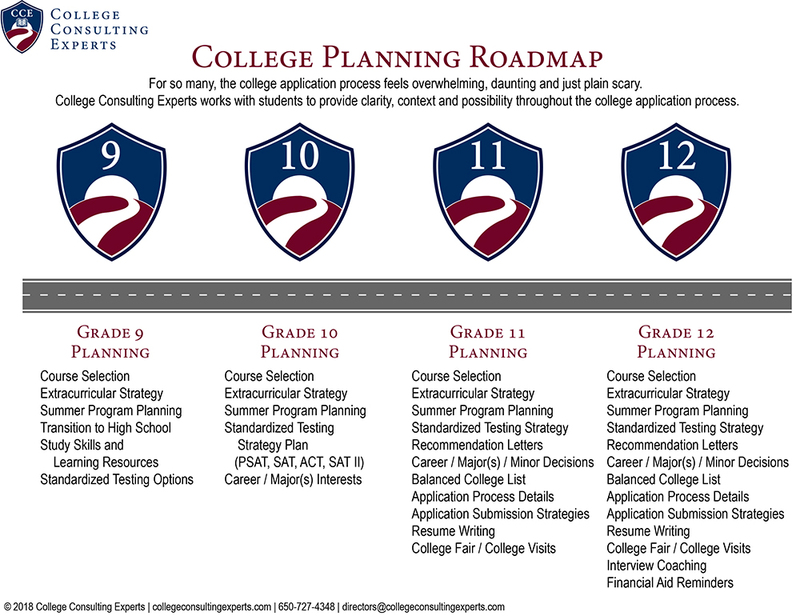 Download a printable version of our College Planning Roadmap. The Freshmen Fundamentals Package is designed for the student who desires a head start in the college planning process. By beginning early, the student has time to explore and plan for the upcoming years of high school. This package is a year-long commitment which includes 3 strategic meetings that will allow students to consult with the College Admissions Consultant during the months of October / January / February or March of Freshmen year. The Sophomore Starters Package is designed for the student who wants to get a head start in the college planning process and is ready to make the full 3-year commitment to College Consulting Experts. The program covers all topics in the Sophomore Starters Package + Junior Leap Package + Senior Stars Package. During Sophomore year, we will have 3 strategic meetings that will allow students to consult with the College Admissions Consultant during the months of October / January / February or March of Sophomore year. The Junior Leap Package is designed for the student who is focused and ready to start planning ahead. Thinking about college is an exciting time, but often the privilege and access to higher education is clouded with stress and anxiety. Our consultant’s job is to build confidence, create a space for concrete discussions about career goals, and optimize a student’s application profile by showcasing their very best. The Senior Stars Package is designed for the student who realizes that they will need support and assistance in the college application process. At this point, the goal is to provide the student with confidence and encouragement that they will succeed and make it through the application process. Our consultants’ job is to create a space for concrete discussions about how to showcase the student’s best application profile.